of Homeland Security to explore the development of chemical-free municipal water treatment systems. parasites and/or chlorination by-products that pose health risks. If we don’t filter out these contaminants prior to consumption, we force our bodies to become the filters. Many have switched to bottled water under the false assumption that its purity is assured to be better than that of tap water. The truth is that bottled water is only required to be “as good as” tap water, not better. should reduce the level of contaminants in your water and enhance its natural taste while preserving the essential minerals. It should do so cost-effectively on an on-going basis. Zuvo has developed a unique, patented 5-step drinking water improvement process called “puration”, which brings you healthy, fresh tasting water at a value price. Here’s how it works. 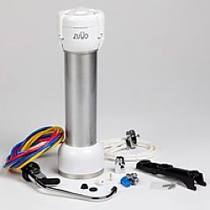 Using a special UV lamp, the Zuvo Water Purator™ produces ozone, one of the most powerful oxidants known to destroy contaminants. This ozone mixes with incoming tap water, oxidizing contaminants while leaving no chemical residue to affect the taste and freshness of your drinking water. to disinfect bacteria and microbes and improve the safety and quality of tap water. UV energy “catalyzes” ozone, producing an even more rapid and effective disinfection reaction that is capable of reducing many times more bacteria and microbes than either ozone, UV or other types of filtration alone. A high-performance, 2-micron carbon block filter effectively reduces dissolved lead, chlorine, and microscopic organisms like the disease-causing cysts cryptosporidium and Giardia. 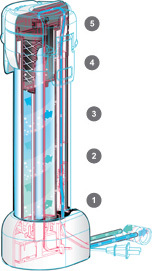 As a final protection against microbial contamination, treated water in the Zuvo Water Purator is exposed a second time to the same high-intensity germicidal UV energy before flowing out of the system. 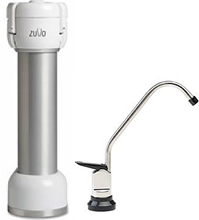 Zuvo is committed to providing safer, cleaner, better-tasting water right from the tap. So go ahead, drink to your health! Activated carbon filter (installed), adapter/diverter for standard faucets, and complete Under Counter Kit with chrome faucet, mounting bracket, and install fittings. use. Includes 2-micron activated carbon filter rated for at least 500 gallons or 6 months normal use. a GFI outlet under the sink. It can be placed on the floor or on a wall using the supplied wall-mount bracket. The kit comes complete with mounting bracket, supply line “T” fitting for connection to water supply, push button “pressure relief” faucet with color coded tubing and easy to follow instructions.